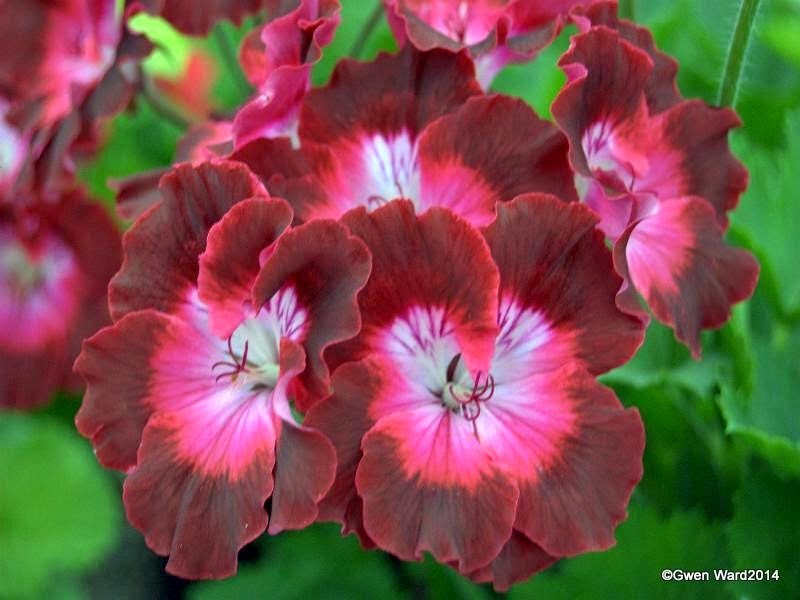 As I'm sure you all know, I'm not a fan of Regal Pelargoniums - I like to look at them, but that is as far as it goes. However, this one stood out for me when I was visiting Fibrex Nurseries last year. Large blooms of a deep purple, with a magenta centre fading to a white eye. The International Register says it needs hard pruning. Wyck Hill Nursery catalogued this first in 1972. 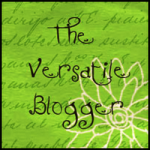 Wordless Wednesday - 25/06/14 - "Lavender Grand Slam!" These are a bit of a mystery. I started to write about Royal Ascot (being fairly topical just now) and came up against a couple of anomolies. I knew Royal Ascot is a sport of Beromunster, but where do these come from? So far I have discovered that Royal Ascot first appeared in the Proceedings (?Committee meetings) at the Royal Horticultural Society in 1891. It was awarded a Floral Certificate, one of two awarded at this meeting (the other was an ivy leaf: Beauty of Castle Hill). Royal Ascot was described as "Brilliant scarlet, white centre, dark blotches, making it Regal group". It was presented by C. Turner of the Royal Nurseries, Slough. I have not been able to ascertain where Beromunster came from - Beromunster is a place in Switzerland, so could that be where it came from - and it must have been before 1891. 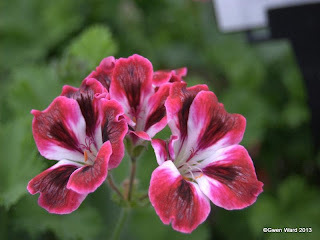 Wordless Wednesday - 18/06/14 - "Lara Joan"
"Silver Blazon" is a dwarf silver tri-coloured pelargonium with single cherry red flowers. The leaf has a solid dark medallion centre. This is another of the late Brian West's raisings, and he introduced several with the pre-fix "Silver". "Silver Blazon" is from "Priory Shield" and"Ian Gillam", and introduced through Fibrex Nurseries. 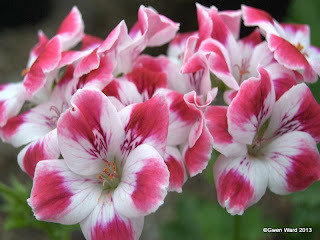 Pelargonium enthusiasts will be saddened to learn of the death last week of Ian Gillam in Vancouver. Ian, who had emigrated to Canada from the UK, introduced the very well known Vancouver Centenniel, and Lotusland, both always available in Garden Centres every year, as well as Elsie Gillam, (named for his mother) Shirley Gillam (named for his wife), Shirley's Sister, Jericho, Spanish Banks, Kitsilano, and many others. I was fortunate to meet with Ian and his wife when on a visit to Vancouver a few years ago and they made my friend Sandy and me very welcome. Ian showed us several Uniques he was working with at that time. He also showed us where he kept his plants during the cold winter months they have in Vancouver. Ian is famous for keeping his new raisings on the kitchen windowsill, but he also kept many of them in his basement surrounded by a silver foil 'fence' with a dayglo light above. Although not many of his plants were available over here in recent years, he will be missed. Silver Bi-coloured zonal pelargonium "Sammi Brougham"
Another beautiful pelargonium raised by the late Brian West. Sammi Brougham has single white flowers which are heavily speckled and splashed with bright red, set against silver and green bi-coloured leaves. This is a cross betwen Chelsea Star and Vectis Volcano. A couple of weeks ago members of The Pelargonium & Geranium Society Committee were at Wisley for the weekend to promote the Society. It was a successful weekend and we all enjoyed chatting to members of the public, giving them advice and explaining the various types of pelargoniums. 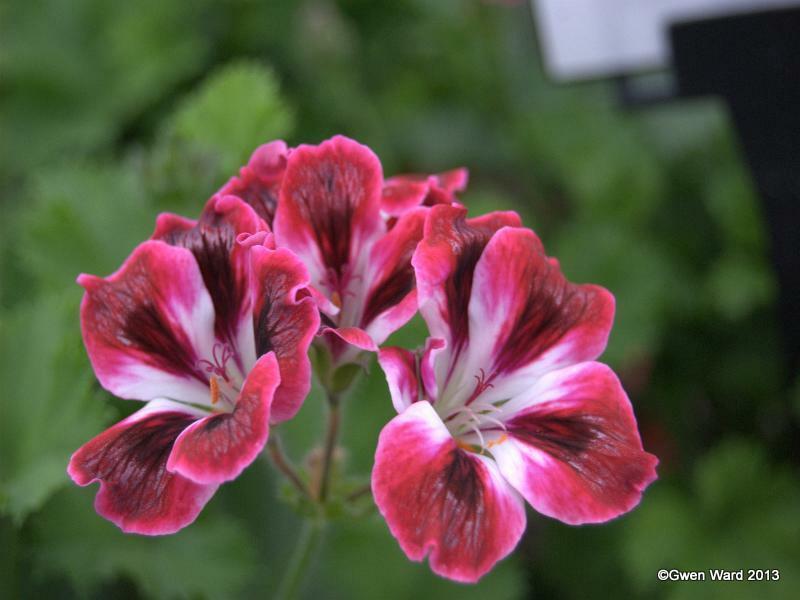 Members who joined The Pelargonium & Geranium Society over the weekend were given a free scented pelargonium supplied by David and Susie Taylor of Gosbrook Pelargoniums. 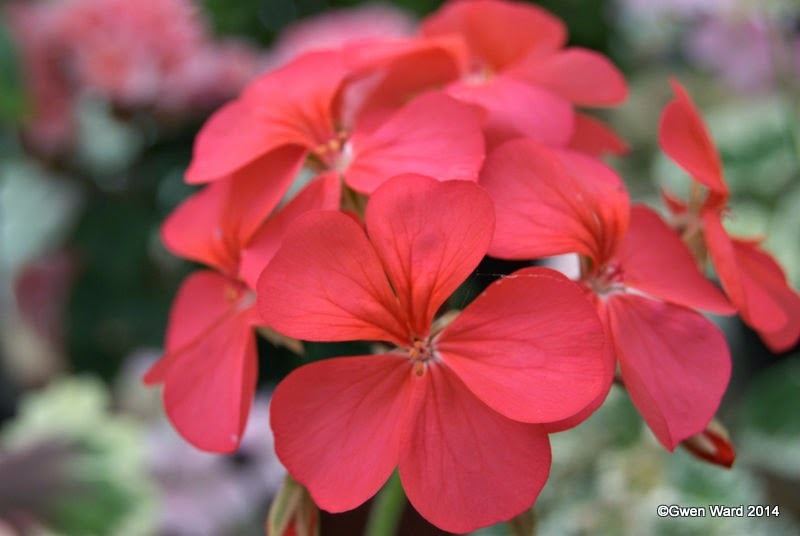 Each year the staff at Wisley put on a magnificent display of pelargoniums in the Glasshouse. 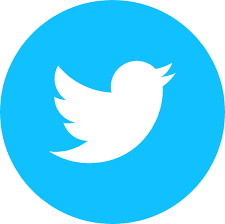 It will run now until 16th June. It is well worth a visit, but if you are not able to, then here are some photo's of the displays..